Learn how to make the famous dim sum classic, shumai – steamed dumplings filled with juicy pork and shrimp. It’s a perfect party food to make in advance and serve later. 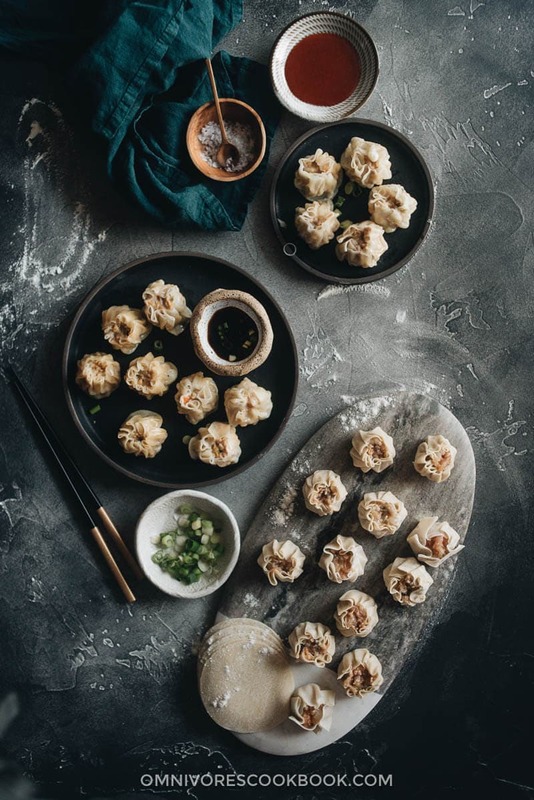 Shumai, or open steamed dumplings, are often associated with Cantonese cuisine. After all it is one of the most popular dim sum dishes. What you might not know is that shumai actually originated in Hohhot, Inner Mongolia. Growing up, northern-style shumai was one of my favorite staples. The northern type is usually filled with pork or lamb, and uses a slightly different wrapping method. Later on, I fell in love with Cantonese style shumai, which usually use egg wrappers and have seafood mixed into the filling. Back in China, whenever we’d have Cantonese dim sum, the pork and shrimp shumai and crystal shrimp dumplings were our must-order dishes. You can easily prepare them ahead and freeze them for later. They look very pretty and impressive – a perfect appetizer to serve at any dinner party. You can wrap lots of filling into each dumpling, making them even more satisfying than potstickers. 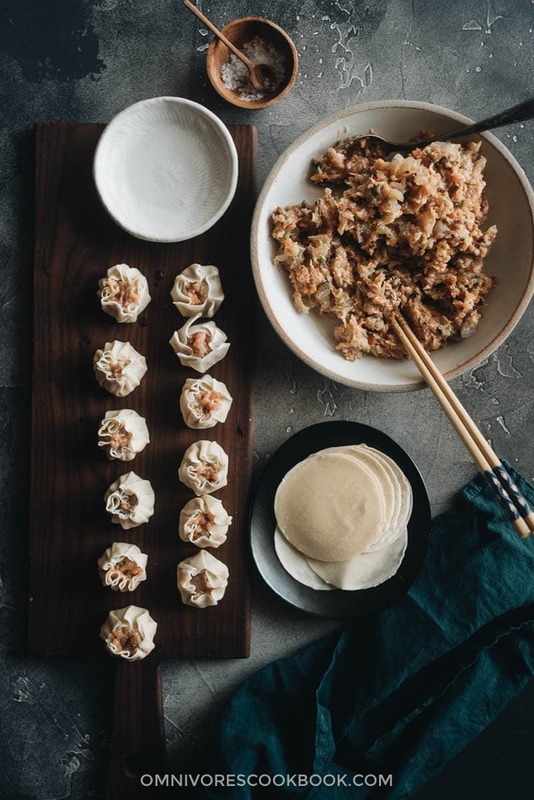 This shumai recipe is the classic Cantonese version, filled with ground pork and shrimp. 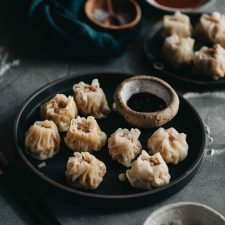 I learned to make shumai from Everyday Chinese Cookbook – 101 Delicious Recipes from My Mother’s Kitchen by Katie Chin. The book is a collection of family recipes from Katie and her mother Leeann. 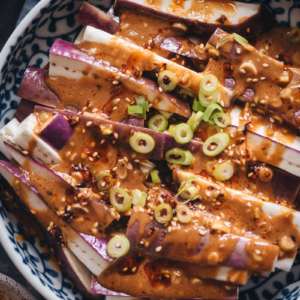 It includes many unique dishes that Leeann developed during a six-decade career in the food business, including time-honored classics that she learned from her mother in China. The cookbook not only contains many classic dishes, but the instructions are written in a way that’s accessible to non-Chinese readers. 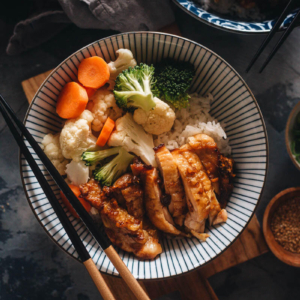 Katie provides tips and techniques which allow anyone to create a refined and tasty Chinese meal at home. Although it’s possible to use ground chicken or extra lean ground pork to make the filling, I always prefer a fattier mix of ground pork, one that contains at least 20% fat. The filling will end up juicier and tenderer that way. This recipe uses a traditional approach – hand chopping all the ingredients for the filling. I used this approach because I love to have different textures in the filling: silky ground pork, chunky shrimp, and spongy mushrooms. Alternatively, you can also use a food processor to make the filling. In this case, coarsely chop everything, except for the shrimp and the mushrooms, and add it into the food processor. Once the blend reaches a smooth texture, add the shrimp and mushrooms. Mix until the shrimp are chopped into small pieces but not into a fine paste. 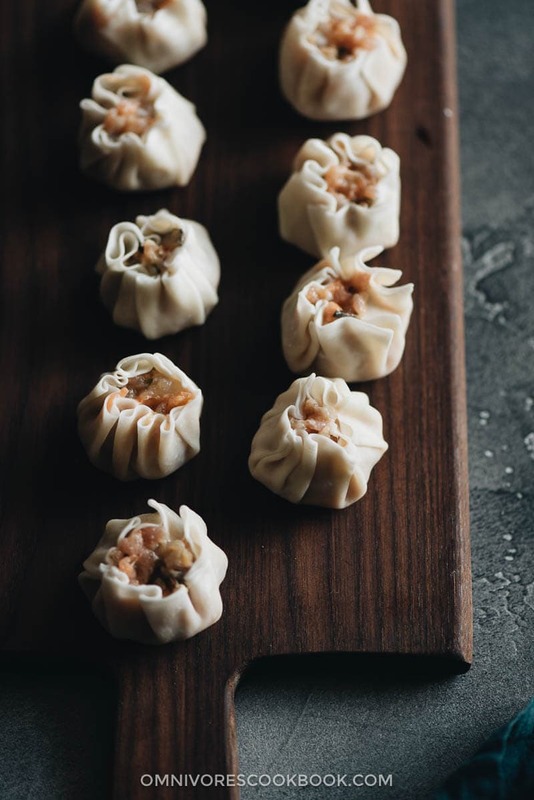 Shumai wrapping is very forgiving and is easier than potsticker wrapping. 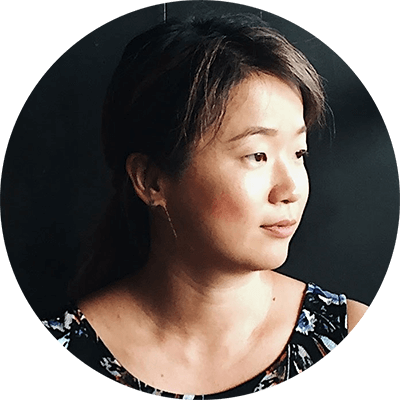 If you want the pleated look, you should fold them like dumplings 1/4-inch (1/2-cm) below the edge. At the end, use your thumb and index finger to lightly press the top without closing it, while using the other hand to hold the bottom. If you do not want to fold the pleats, you can simply press the wrapper with filling so it forms a short cylinder. They taste great either way! If you’re unsure about the wrapping and would like to watch a video, leave a comment below. If I see enough requests, I’ll create a short video to show you how. Shumai store very well in the freezer, so they make a perfect dinner party dish. You can wrap the shumai and store them uncooked. Right before serving, simply steam the frozen shumai without thawing. They taste just as great as fresh ones. Making dim sum at home requires some effort and time, but the result is so rewarding. 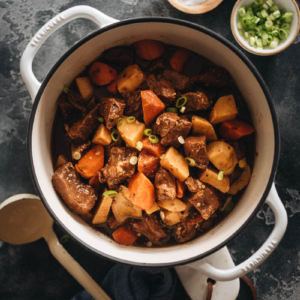 If you give this recipe a try, let us know! 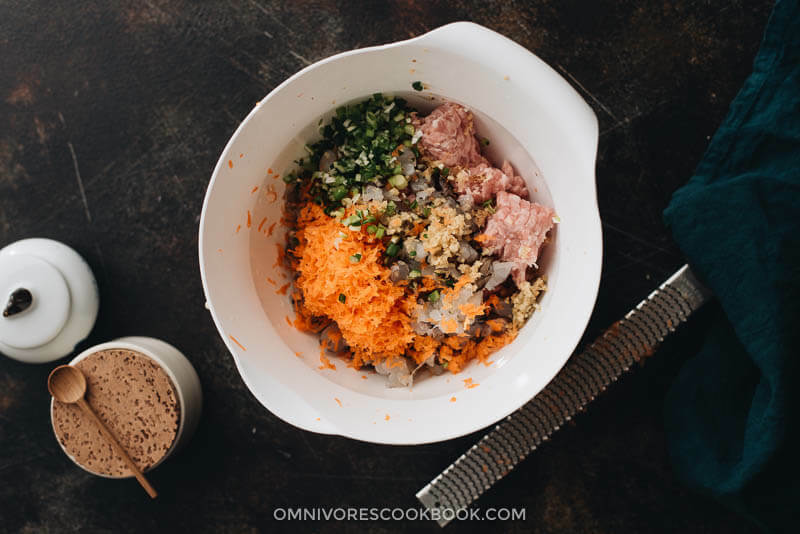 Leave a comment, rate it (once you’ve tried it), and take a picture and tag it @omnivorescookbook on Instagram! I’d love to see what you come up with. 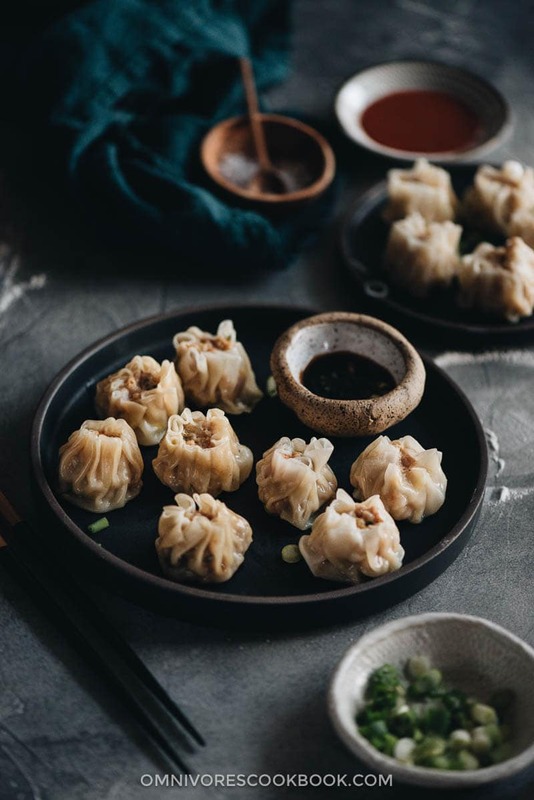 Learn how to make the famous dim sum classic, shumai - steamed dumplings filled with juicy pork and shrimp. The recipe is adapted from Everyday Chinese Cookbook - 101 Delicious Recipes from My Mother’s Kitchen by Karie Chin. Soak the mushrooms in hot water until soft, 20 to 30 minutes. Rinse with tap water and gently rub to remove any dust. Drain and squeeze excess water. Mince into small pieces. Combine the rest of the filling ingredients. Stir to mix well, until the paste becomes sticky and a bit springy. Work on the shumai one by one. Place a dumpling wrapper on a clean work surface. Place 1 tablespoon of filling in the center of the wrapper. Bring the edges up around the filling, pinching and pleating, leaving the top open. Repeat with the remaining wrappers. Line your steamer with a clean, wet dish towel or steaming parchment (*footnote). Transfer the shumai into the steamer, one finger’s width apart. Cover and steam over boiling water for 8 minutes, until cooked through. Serve with dumpling dipping sauce of your choice or Chinkiang vinegar. Place the uncooked shumai on a lightly greased baking sheet, one finger’s width apart. Cover the sheet with plastic wrap. Freeze the shumai until completely frozen. Then you can transfer them to bags or containers to save freezer space. Steam the frozen shumai without defrosting or thawing. After bringing the water to a boil, steam until completely cooked through, 15 minutes or so. I got this great new bamboo steamer for christmas and haven’t had the chance to use it yet. And I love shumai, so perhaps this should be my first recipe! I’ve never made shumai before, so I can see this being a learning experience, but am determined to start making my own dim sum. Plus I love that you can make these ahead of time and freeze them. It’s perfect! 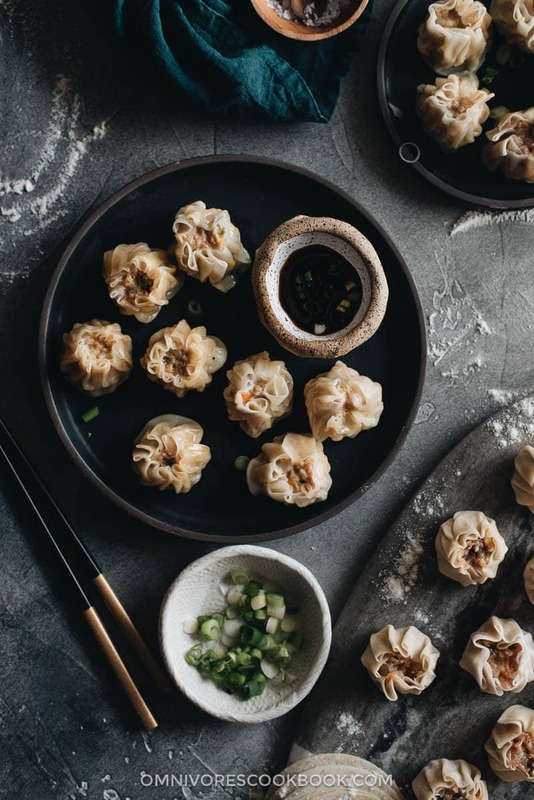 Oh, these are some beautiful photos and I think these dumplings look spectacular. I would love to see a video on wrapping Shumai. That would really be helpful for the totally inexperienced. Thanking you in advance. This is a fantastic recipe! This is the 4th or 5th recipe that I have tried from this website. They are all so clearly laid out, and the photos are stellar. The Dan Dan Noodles were outstanding, but now the Shumai might be my favourite. They tasted like I was at Dim Sum! I got only 30 pieces, I think because my wrappers were too big (long story). We ate half and I froze half, so we’ll be enjoying them again soon! Please post a video on how to wrap them!!! Nice receip. Please, post the video to see how to wrap it! These look amazing. If you could make a video on the wrapping that would awesome!! !